Your car’s cooling system does a lot more than prevent the engine from overheating. 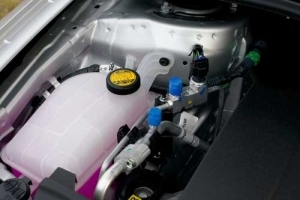 As far as most people are concerned, a car’s cooling system has one purpose: to keep the engine from overheating. And there’s little doubt that’s an important part of its job. But that’s not all the cooling system does. In fact, something else it does that’s extremely valuable is to help the engine heat up quicker and maintain normal operating temperature under a wide range of conditions. That allows the engine and transmission to operate more efficiently, and helps control vehicle emissions. On most cars the cooling system also removes heat from the automatic transmission. And that’s important because the transmission will begin suffer from high temperatures even before the engine will. Finally, the cooling system provides heat to the passenger compartment through the heater core, to keep you cozy and comfortable on the coldest winter days. No doubt about it: your car’s cooling system provides a lot of critical services to keep your car running properly and prevent damage. So it’s obviously a system that you want to make sure is working properly. Your local Cottman center’s technicians can help. They’re very familiar with today’s cooling systems, and know exactly how to keep your car’s cooling system in good working condition. They’ll examine it for leaks and make sure it’s holding the proper pressure. They’ll check the hoses and belts, and measure the coolant protection levels, so you can be sure your car’s cooling system is protected in every season and in any temperature you’re likely to drive through. To have your car’s cooling system checked or serviced, or if you’re having a problem with overheating (or not getting enough heat! ), give your local Cottman center a call. They’ll be happy to evaluate your car’s cooling system and bring it back to like-new condition.